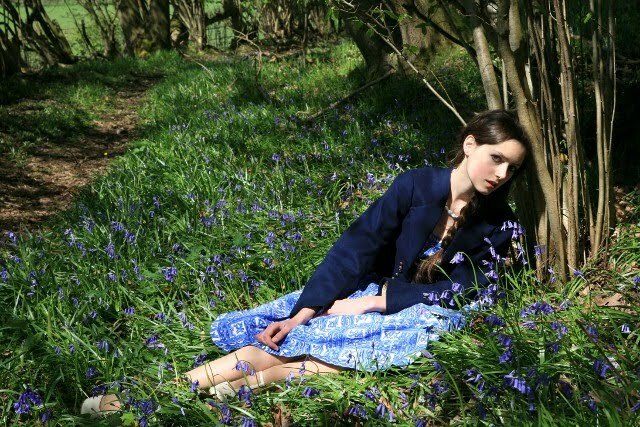 GAAAH, so perfect with the bluebells!I love how the setting always complements the outfit. Very well done! This reminds me of a Teen Vogue editorial with Monika Jagaciak. As for my favorite item of clothing, it has to be a flower-print blouse with puffy sleeves that my mom made as a teen in the 70's, since it also has sentimental value. And I'm very happy to see that you're developing your French skills! It's actually «une petite question», but you'll learn that soon enough...distinguishing nouns' genders is proably one of the toughest parts of learning the language. I'm French so if you ever have any questions, don't hesitate to ask! Bravo once again!! 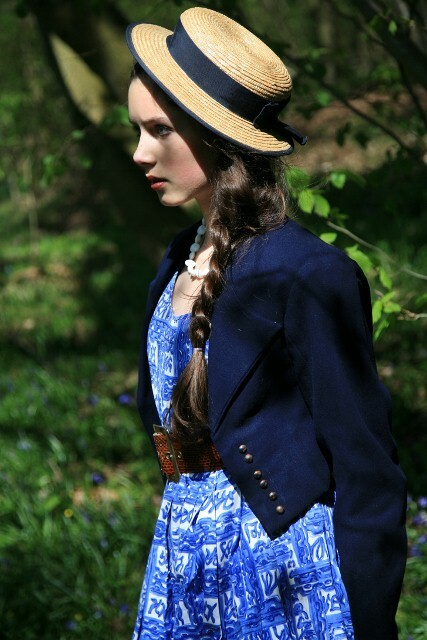 Beautiful photos once again:) I used to have a hat like that, I wish I still did but it looks lovely on you. I would love to visit the flea markets of Paris someday. How lucky you are to be able to go. We added you to our favorite blog roll. I hope you like ours too! it's beautiful. your beautiful. i love every bit of your style there, lady. love Regina! And that's one of my favourites by her, it's so gooood! I have a really pretty cocktail dress that I found a feww years ago. It has a satiny camisole peaking out from a pale blue netted bodice and then it flows into a mermaid-shaped hem. I always feel like a 40s movie star when I wear it, which is not often enough. When I found it someone had pinned some big ugly fake flowers to the waist, and once I took those off it was perfect :). YOU look so beautiful. 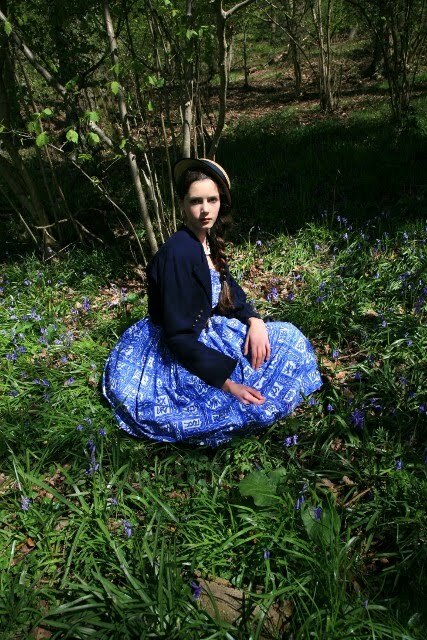 I love the photo series, so gorgeous... the dress, THE HAT, the flowers! You've outdone yourself, Roz. STUNNING! beautiful dress... and amazing you! I wish we had thrift stores that had more of the European brands, but alas the best I've been able to find is Ann Taylor or BCBG (neither of which are low brands by any means, but it'd be nice to find a vintage Chanel piece once in a while). Just running back out - but had to comment, Roz. I love that look so much, that blue & white tea dress is fabulous & the jacket, belt.. you just have such a sense of style it's amazing. Can't wait to meet & hopefully shoot you. Really great look! You rock that dress. I have several favorite clothing items....too many to name. Lovely pics as always, Roz. I love pretty much everything about these photos. The dress, that sweet straw boater, the structure the military-esque jacket adds, all against that lush green back-drop...sigh, so gorgeous. you are so pretty! you look like a fairy! Oh, I love it! 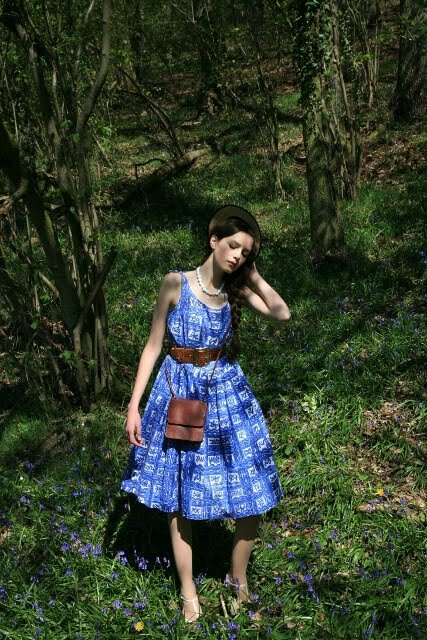 The bluebells are perfect, and you seem really adept at styling vintage. The lighting in that second (seated) photo is amazing--like the sun picked a little clearing just for you. Wow, Roz you look absolutely gorgeous in these shots. Your photos are getting more and more like real editorials, they look amazing, the lighting is great as well. Your dad is really talented. I'd love an editor to see your work, i'm sure they'd snap you up immediately. My favourite piece of clothing ..... I have so many, but absolutely adore a black leather satchel that my boyfriend surprised me with. Anyway... absolutely gorgeous shots again. so lovely! i love the stories behind the clothes as well. and regina is just so wonderful. blue is an infinitely excellent colour. amazing photoshoot, and i love that you waited for the flowers to bloom. wow that dress looks amzing on you, love the color, your blog/style are great for someone so young!! and you look absolutely fantastic with this amazing outfit! I really feel in love with your beautiful dress! Wow, tough question...it always seems to be changing but I think right now it is a tie between a gorgeous crepe chiffon dress in ivory and a beige linen romper with cuffed shorts...so hard to decide. Lovely outfit by the way, and the scenery is gorgeous! I love your pictures and your look! The outfit seems to be taken from a movie: it's one of a kind! I love it! oh this is SO gorgeous! great idea with the flowers - blue is so beautiful. great outfit, i love the hat and the shoes especially, they remind me of these soft leather dancing shoes my mother wore when she was younger. classic! Fabulous hat, I bought a similar one, but miniature size with a comb to slide into your hair, from H&M. Love the dress and the photos are divine as always. It is such a difficult question, one that I always fail to answer. If I had to, at the moment, it would be my apple green shirt with pleated mesh colar from H&M, completely extravagant yet subtle. you are just too beautiful for words! jill from street style recommended your blog to me, so i just had to take a look. the dress is just so adorable, and the straw hat suits you perfectly. i also love the fact that your dad takes the majority of your pictures, i think that is just lovely! The second and last photos are outstanding! Your dad does a great job in taking your pics. That must have looked adorable...you in this outfit and gummies walking along the path! haha love it. So perfect with the blue bells. I love how you saw potential in the dress and picked the sleeves off....some people don't even think of doing that...power to ya. Question...what kinda under garment are you wearing to give the skirt that shape? As far as fav's go...I couldn't possibly pick and try not to have favourites....all my clothes have such an emotion & memories behind them. great outfit. love the hat. Beautiful pictures, i follow your blog! wow your blog is so fantastic, and i love regina spektor and i love your braid! OH you're pictures are so fantastical! I would very much like to steal that hat of yours. I now crave a very tart blueberry muffin. love this shoot as well! !